On the 3rd May, a First Saturday, Mrs. Vivienne Lardeaux, of Warden Manor on the Isle of Sheppy, Kent, England, passed to the next life at the age of 85 years. Rev. Fr. Anthony Mary, C.SS.R. and a number of brothers travelled from Papa Stronsay to the Isle of Sheppy to sing her funeral Mass on Tuesday 20th May. Holy Mass was offered in the Monastey chapel. 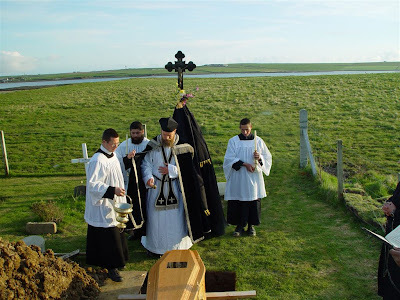 Mrs. Lardeaux's mortal remains left Sheppy to be flown up to Papa Stronsay to be buried. On the evening of Friday 23rd May, Mrs. Lardeaux's coffin arrived On Papa Stronsay. After a second Mass for the repose of her soul, the procession to the Monastery cemetery set out from the chapel. The evening was beautiful, and our donkey once again took the body to its final resting place.